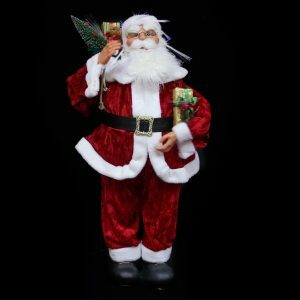 Measuring approximately 9cm wide by 9cm in height, this Standing Santa with Banner is the perfect little accent to stock up on and have on-hand during the holidays. First, this smart little chap would be stunning on a tree. Use several of these whimsical little elves and simple warm-white LED lights, offered and sold separately, for a Christmas tree theme that is enchanting and welcoming. Second, give this curious fellow to someone else. Use the metallic hanging cord to hang him on the door of a neighbour or friend who you appreciate all year long! 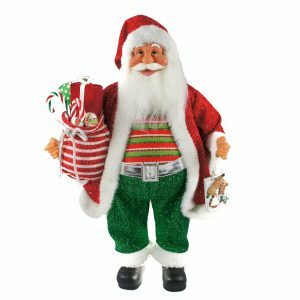 He is a great item to give to mail carriers, hair dressers, and anyone who you want to share a bit of festive holiday spirit with. Children love the detail of this fine ornament, and the furry beard, snowflake sweater, and tiny bell on Santa’s cap are just a few of the features that will delight and charm buyers.